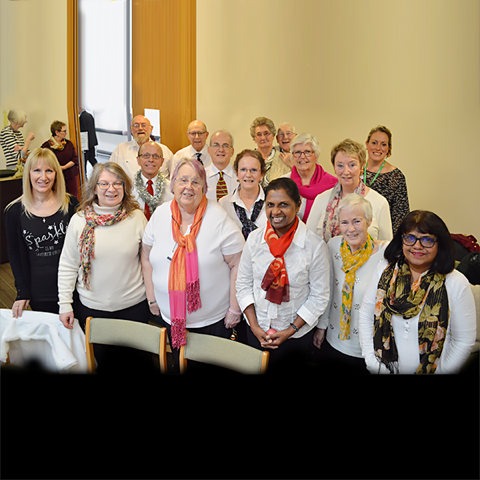 Beyond the C are a choir based in Peartree Bridge, Milton Keynes led by Macmillan Nurse, Fay Grech Marguerat. Started in 2016, all of the members of Beyond the C have been affected in some way by cancer. Some are survivors, others are carers of cancer sufferers. The group meets once a month and has a large repertoire of popular songs. Pianist, Caroline Dickens is their accompanist. Beyond the Sea is an English version with lyrics by Jack Lawrence of the 1945 French song La Mer by Charles Trenet. Caroline Devine recorded Beyond the C choir singing Beyond the Sea at their rehearsal on 28 July 2017. As part of the sound installation, she is using the tannoy system of the Shopping Centre to play the voices of the choir throughout the entire Shopping Centre building every two hours from 10am during the period of the City of Things exhibition.